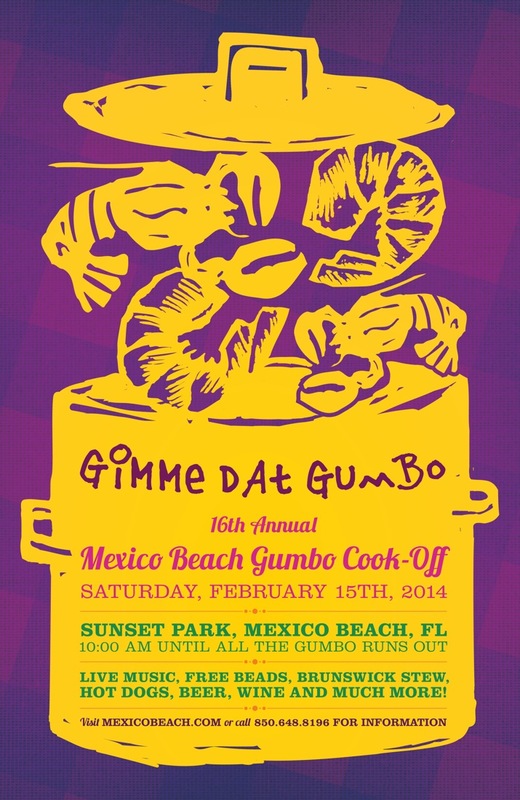 We’re Heating Up for the Gumbo Cook-Off Next Weekend! Get ready to grab a spoon and dig in! It’s that yummy time of year again when Mexico Beach is heating up for its annual Gumbo and Brunswick Stew Cook-off, held Saturday, February 15, starting at 10:00 a.m. Follow your nose to Sunset Park, where giant pots of spicy gumbo and savory Brunswick stew will available for sampling. You can buy tickets for tasting one, two, or as many as you like! After all, you can chalk it up to “research.” Plus, this popular event raises funds for Mexico Beach’s spectacular Best Blast on the Beach 4th of July fireworks display, and we hope you’ll come back for them as well! If you’re not from the Southeast, you may not be familiar with this rich, savory concoction that both Brunswick, Georgia, and Brunswick County, Virginia, both claim as being the first to ever make. Regardless of whose roots are the deepest, Brunswick stew recipes vary far and wide, just as gumbos do. Brunswick stews are alike in the fact that most are tomato-based and include a variety of vegetables, such as lima or butter beans, corn, and various meats. In fact, Brunswick stew is like a flavorful vegetable soup, only thicker and it usually simmers for a good while longer! Brunswick Stews from the “Deep South” tend to have a distinct smoky taste, which is thanks to barbecued meats such as pork and beef. Stews made south of the Virginia border are also typically thicker, since potatoes are usually a key ingredient. In contrast, Virginia’s stews are characteristically thinner, and have a soup-like consistency, since they go heavier on the tomatoes and typically omit the starchy “spud.” Virginia hams may be smoky, but their Brunswick stews usually are on the lighter side in terms of meats—and calories—since chicken and rabbit are their preferred proteins. Who Will Be the Gumbo King? Besides lots of great food (BBQ, hotdogs, and beverages will also be available), there will be live music by Stainless Steel and plenty of free beads to get you in the Mardi Gras mood! Immediately following the Cook-off is the 2nd Annual SEA Art Walk, which is a juried art show proudly hosted by the Society of Expressive Artists (S.E.A). Strung like a strand of pearls up and down Highway 98, local artisans will be displaying their one-of-a-kind works. And since it’s Valentine’s Weekend—keepsake art makes a wonderful and memorable gift for your sweetheart! For more information about the 16th Annual Gumbo & Brunswick Stew Cook-off or to participate in the cooking competition with a last minute entry, CLICK HERE. Note: Friday, February 7th is the absolute deadline for entries!